The summer heat in Tennessee can get prickly. And to stay comfortable indoors, you’ll need a properly functioning air conditioning system. An AC breakdown will expose your family or business to uncomfortable temperatures. But that doesn’t have to happen. 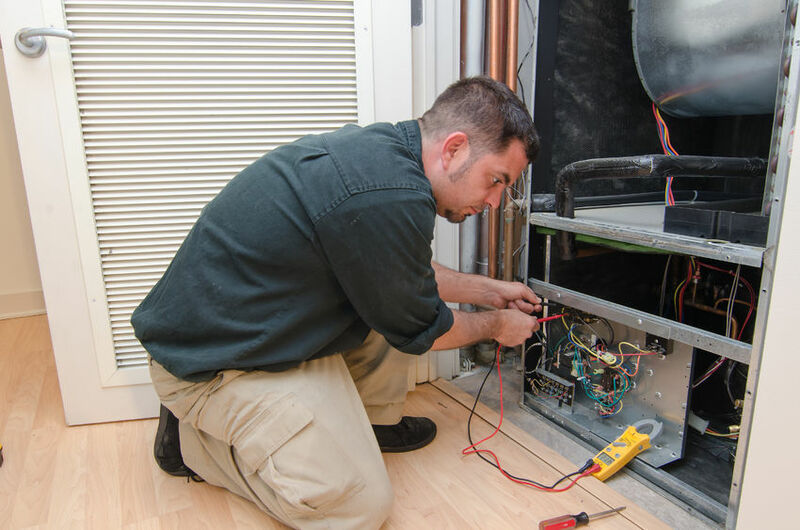 When you start to detect signs of a problematic AC system, schedule an AC repairs service in Knoxville, TN right away. An optimally functioning unit means you can keep everyone in your home or office comfortable. On top of that, you can ensure that the air is cool and clean when temperatures rise. Make JC's Heating and Air your first call when your AC breaks down. Our qualified HVAC technicians conduct air conditioning repairs and installations in Knoxville, TN. Enjoy year-round comfort with regular AC maintenance. Through annual services, you can avoid the need for costly, emergency repairs. We’ve been in business since 2001, and we know residential and commercial HVAC by heart. Our technicians leave no stone unturned, thoroughly inspecting your AC system’s filter and ducts. We also ensure that all your unit's essential components stay properly lubricated. The hotter months, the season when you need air conditioning the most, is perhaps one of the hardest times for your AC. Dozens of issues can pop up since your AC is working harder. And when your unit stops working, you need to identify the issue immediately before they cause long-term damage. You need to work with a qualified air conditioning service provider in Knoxville, TN who can properly diagnose and repair the problem. JC’s Heating and Air will check to see what the problem is, and will make all the necessary repairs so that your HVAC system can function properly year round. A standard air conditioning system is supposed to last for a maximum of about 15 years. As your heating and cooling system ages, it may not function properly because it has already reached its maximum lifespan and needs to be replaced. Your new system should be energy-efficient, and it should meet the specific needs of your home or office. We have all of your a/c system needs. From split systems, to central air conditioners, mini split (ductless) systems, down flow systems, to rooftop systems. You should be comfortable, relaxed, and able to breathe at home—and you shouldn’t pay a dime more than necessary for that privilege. That’s why we offer the most efficient systems for your home; we have two-stage compressors that run at full capacity only when you need it to. Some of other AC systems have an inverter compressor, which controls the speed of the compressor monitor and continuously regulates the temperature. These systems include the refrigerant 410A, which has replaced R-22 as the preferred refrigerant to use in residential and commercial air conditioners. The refrigerant 410A does not contribute to ozone depletion, as well, and has a higher SEER rating than R-22 systems. Central Air Conditioners: This is a very convenient and efficient system which supplies cool air through the various ducts in your home or office. These types of units supply and return ducts can be located in the ceiling, walls, or floors. They are efficient because they cool your entire home or office and not just a single room. Ductless Air Conditioning Systems: This system is gaining in popularity and appeal and are ideal for people who don’t have any preinstalled ducts in their home or office. They work well for anyone who wants to cool a particular zone or room in their home or office. These systems are usually small and very flexible, because they are meant to cool a particular room or area in the home. Down Flow Systems: These systems are usually very common in computer server rooms and data centers. This a/c system is usually placed around the perimeter of the server room or data center. The cool air will flow through the grilles in order to cool the hardware cabinets. The hot air will go back to the top of the air conditioning unit. Rooftop Systems: These air conditioning systems are placed on the roof of a home or office and it circulates cool air throughout the building via openings in the roof. This type of system is most popular with businesses but a lot of residential homes are also using this type of a/c system these days. Our company also offers 10 year warranties which include parts and labor. On some systems we offer a "pledge warranty" which states that if a compressor fails within first (10) years we will replace that system. We have rebates and discounts with many of our systems. It is very important to hire a professional HVAC technician to handle any of your air conditioning maintenance, repair and installation needs. Our qualified and professional technicians have the training and experience to service your air conditioning unit properly in order to prevent any future problems. We can also repair your system when it malfunctions. We are also very skilled at new air conditioning installation, and we can advise you on the best a/c unit to purchase when you need to replace your old, worn out system. I would like to give a plug out to JC’s Heating & Air (again). The AC in one of my condos went out and property management sent over 3 quote options from another HVAC company ranging from $2,745 – $4,587. Within an hour Jason was over there. Freon and a new capacitor = $214. Unbelievable! This is the 3rd or 4th time he’s come to my rescue. Thanks Jason! Keep your AC running smoothly for all the seasons.